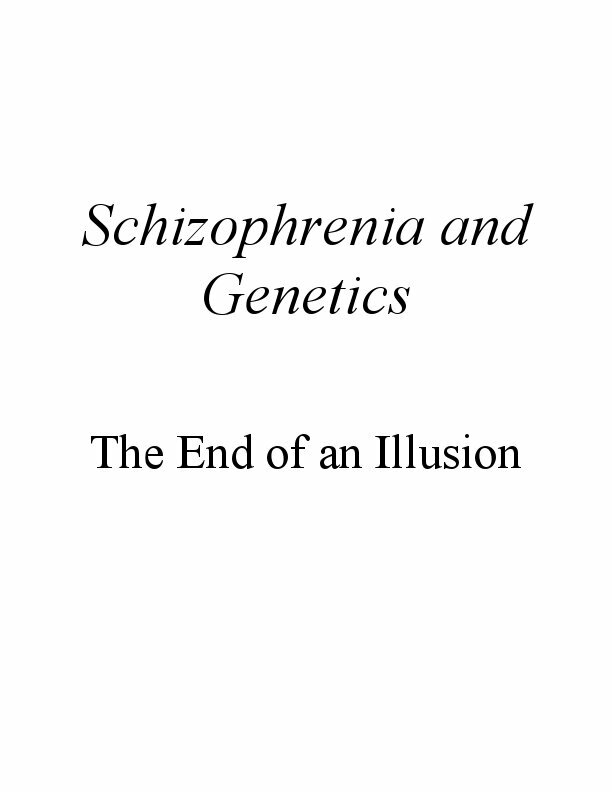 In Chapter 1, psychologist Jay Joseph discusses the schizophrenia concept from several different perspectives, and reviews some problems with genetic explanations. 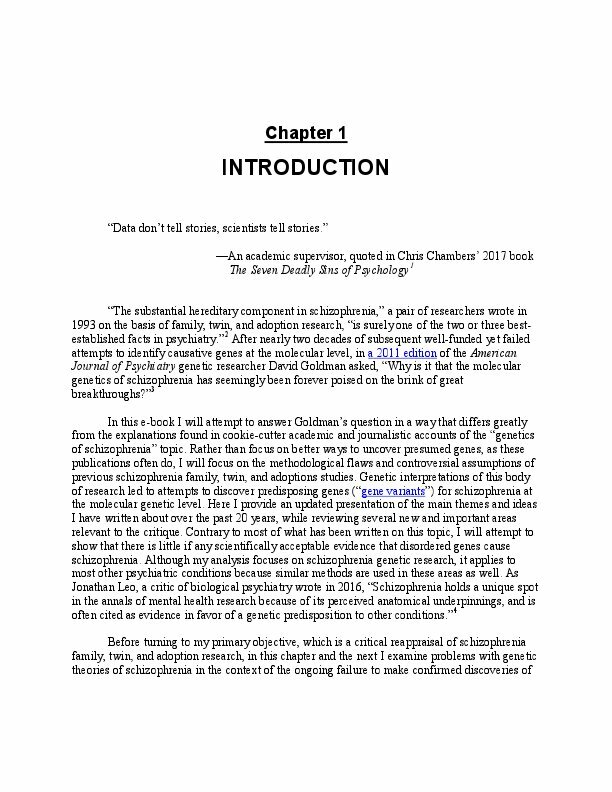 Chapter 2 describes the ongoing failure to make confirmed discoveries of genes shown to cause schizophrenia and psychosis, and contains a brief critique of the heritability concept. Chapter 3 is about schizophrenia family studies. 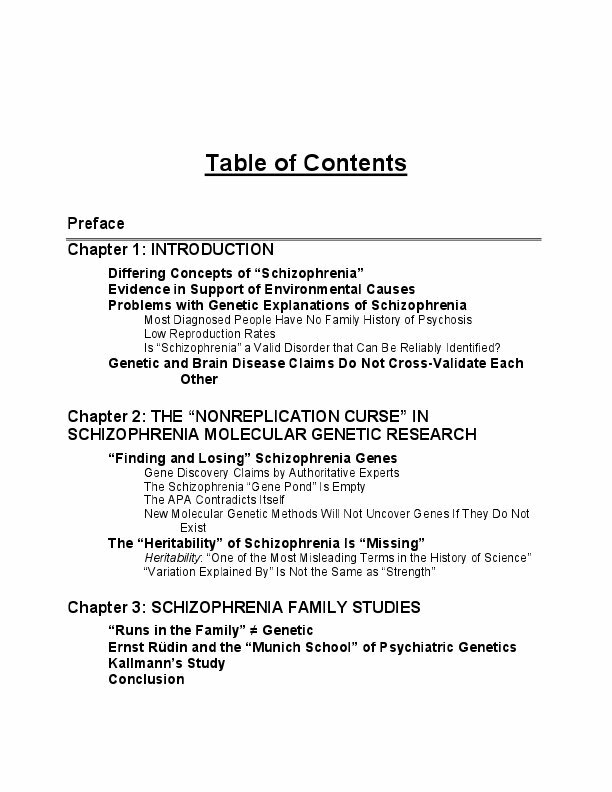 Joseph shows in Chapter 4 that schizophrenia twin studies are based on a critical theoretical assumption that is clearly false, and that these studies therefore provide no scientifically acceptable evidence in favor of genetics. 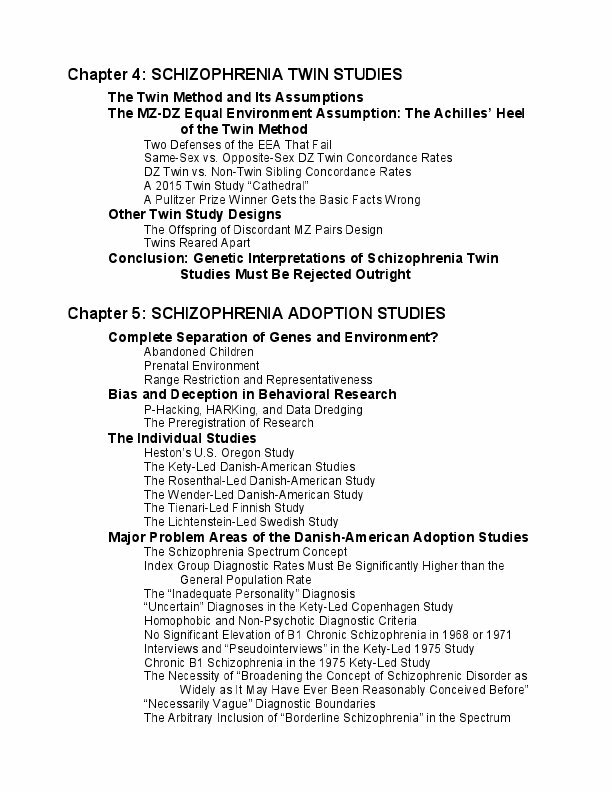 In Chapter 5, which comprises over half of the book, Joseph examines in detail the major problem areas in the most frequently cited schizophrenia adoption studies. These studies played an important role in turning the tide in favor of genetics, yet serve as an example of how entire scientific fields can overlook and even cover-up massively flawed and biased research performed by leading researchers. 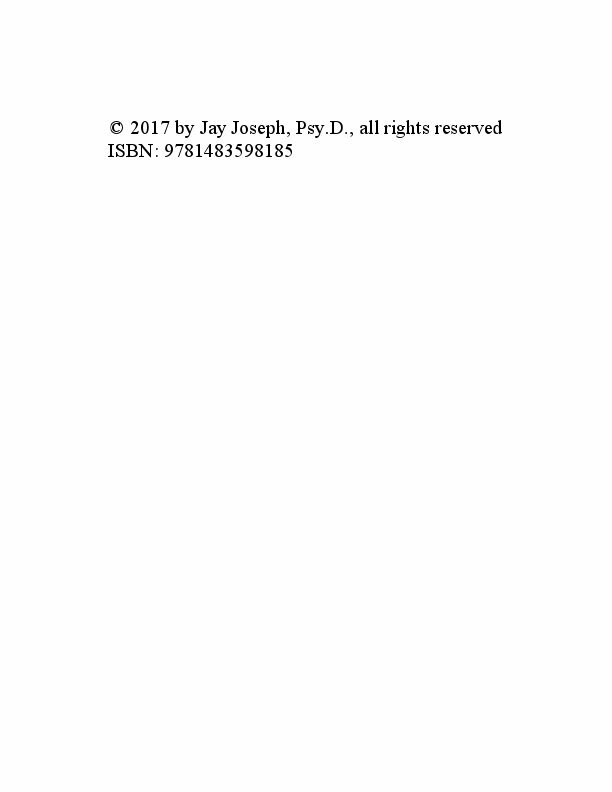 In Chapter 6, Joseph concludes that the evidence in favor of genetic factors is extremely weak, and calls for a shift in the study of the causes, treatment, and prevention of schizophrenia and psychosis from currently dominant biological and genetic approaches, to non-medical and environmental approaches. 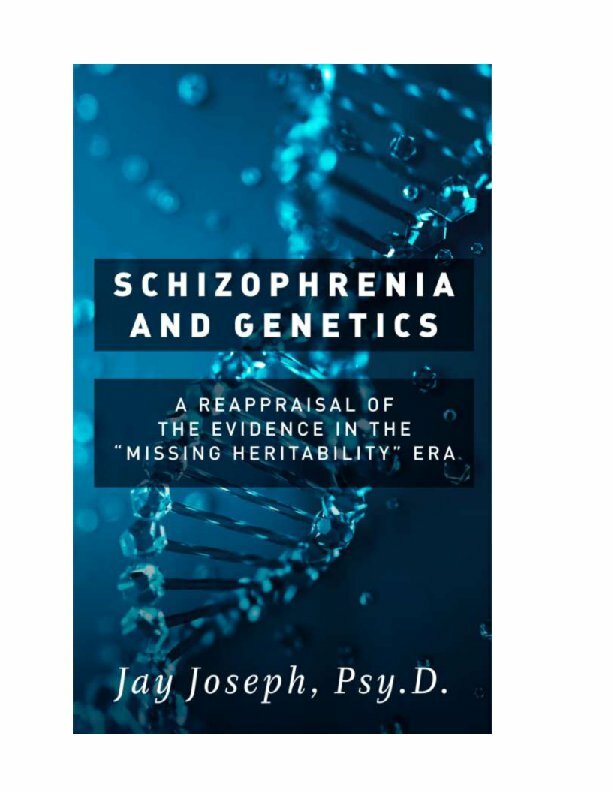 In this context, Jay Joseph focuses on the methodological shortcomings and questionable assumptions of previous schizophrenia family, twin, and adoption studies. He shows that although genetic interpretations of schizophrenia twin studies are based on the assumption that reared-together monozygotic (MZ) and dizygotic (DZ) twin pairs grow up experiencing similar (“equal”) behavior-influencing environments, this assumption is clearly false. He concludes that schizophrenia twin studies, like schizophrenia family studies, are unable to disentangle the potential impact of genetic and environmental influences. In both types of studies, therefore, the results can be explained entirely by non-genetic factors. Turning to adoption research, Joseph puts the influential Danish-American adoption studies of the 1960s-1990s under the microscope, taking readers on a journey through massively flawed, biased, and environmentally confounded studies that have been presented in standard textbooks in a misleading manner since the 1970s. 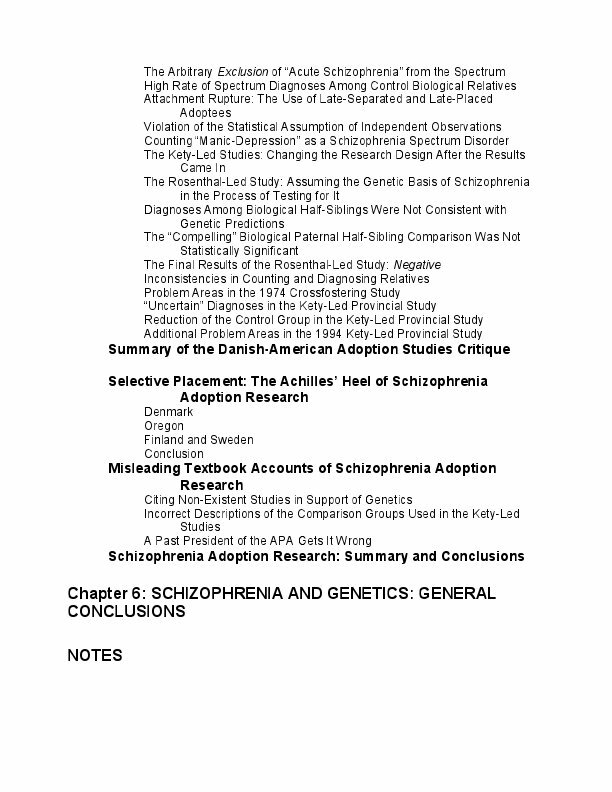 These texts have ignored or concealed methodological, factual, and even scientific-ethical flaws that, in addition to twin studies based on the false assumption that MZ and DZ environments are equal, call into question everything that we supposedly “know” about the genetics of schizophrenia. The authors of these texts often fail to mention studies that do not fit genetic explanations, while on occasion they cite studies that do not exist. In contrast to the prevailing beliefs in the social and behavioral sciences, Joseph argues that there is little if any scientifically acceptable evidence that disordered genes play a role in causing schizophrenia. At the same time, he highlights the evidence in favor of environmental causes, while noting that the validity of the “schizophrenia” concept itself has a long history of controversy. In this book, which brings together many of Joseph’s previous findings in one place while exploring many new areas, the main issues are approached from a refreshingly critical perspective. This stands in direct contrast to the cookie-cutter academic and journalistic accounts of the “genetics of schizophrenia” topic, where it is usually claimed that schizophrenia is a “highly heritable” disorder involving a disease process of the brain. Joseph presents an up-to-date, thoroughly documented, and much needed critical evaluation of schizophrenia genetic research. His findings have important implications for psychiatry, behavioral genetics, and for the social and behavioral sciences in general. In addition, this work is essential reading for anyone interested in the longstanding “nature-nurture” question of whether human behavioral differences are caused mainly by hereditary or by environmental factors. 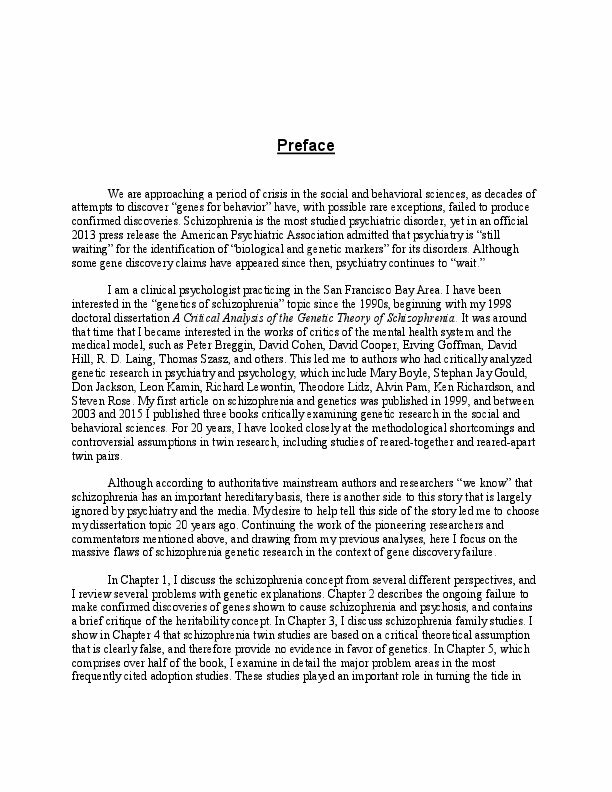 Joseph concludes that the failure to discover genes for schizophrenia, psychosis, and other psychiatric conditions is not a scientific setback but is instead a cause for celebration, as society can now part ways with genetic diversions and medical approaches, and can focus on environmental causes, social interventions, non-medical treatment approaches, and prevention. 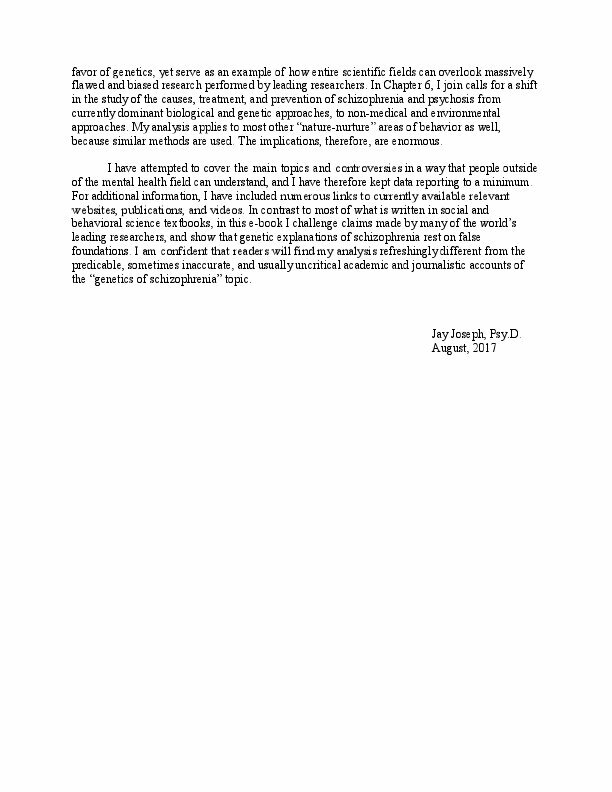 Jay Joseph, Psy.D., is a clinical psychologist practicing in the San Francisco Bay Area. Since 1998, he has published peer reviewed articles and book chapters critically examining genetic theories and research in the social and behavioral sciences. 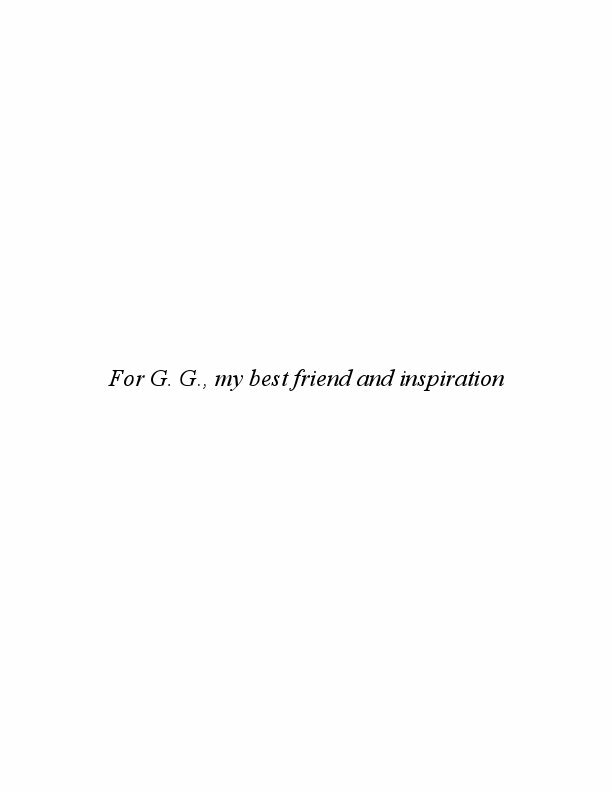 He is the author of The Gene Illusion: Genetic Research in Psychiatry and Psychology Under the Microscope (2004), The Missing Gene: Psychiatry, Heredity, and the Fruitless Search for Genes (2006), and The Trouble with Twin Studies: A Reassessment of Twin Research in the Social and Behavioral Sciences (2015). His blog The Gene Illusion can be found at the “Mad in America” website.